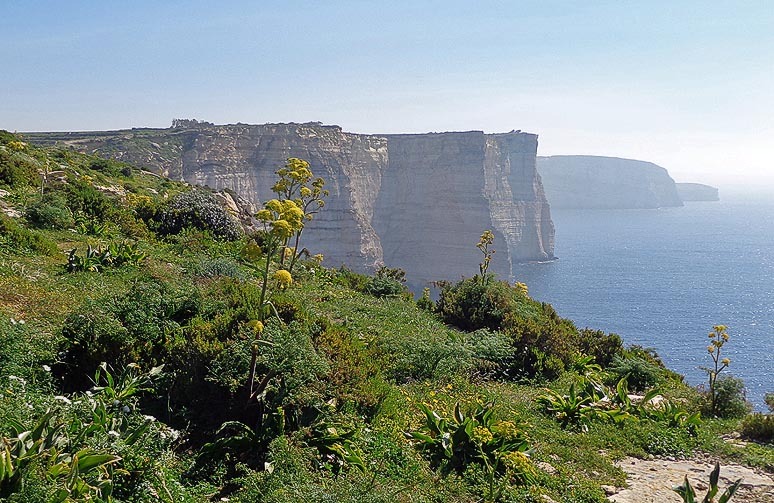 Gozo was recently voted third best Mediterranean island by the independent Trip Advisor site. This should come as no surprise really - the island is conspicuously different from its larger neighbour Malta; greener, much less densely populated and quieter and consequently with a much slower pace all round. Gozo was recently voted third best Mediterranean island by the independent Trip Advisor site. This should come as no surprise really - the island is conspicuously different from its larger neighbour Malta; greener, much less densely populated and quieter and consequently with a much slower pace all round. 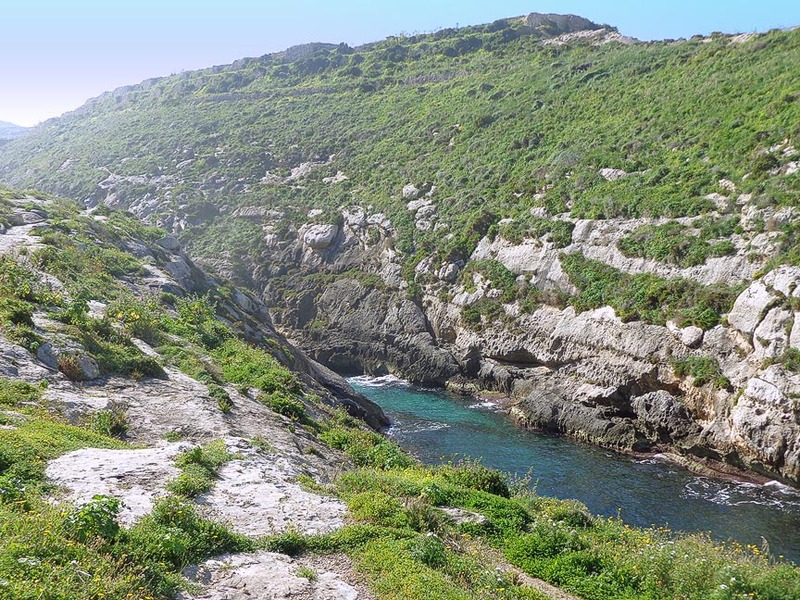 One of Gozo’s notable differences is a much less developed coastline and luckily it will probably stay that way too – half of the coast consists of high and very scenic cliffs. A trek along part of these cliffs at any time of the year is a rewarding experience and much easier than one might think. One such walk starts from the popular resort of Xlendi, simply by following the promenade on the left hand side of the bay. As the promenade comes to an end there is a small bridge which gets you across the mouth of the Wied ta Kantra – a steep sided dry valley bordered by a varied vegetation. From here make your way to the tower at the end of the bay. There are good views of the cliffs further to the north of Xlendi from here. Past the second inlet a veritable cliff wall comes into view but don’t be disheartened…the trek continues some way inland making for a less steep climb before rejoining the edge. Once at the top the full sweep of the cliffs (called the Sanap cliffs in this area) can be appreciated. 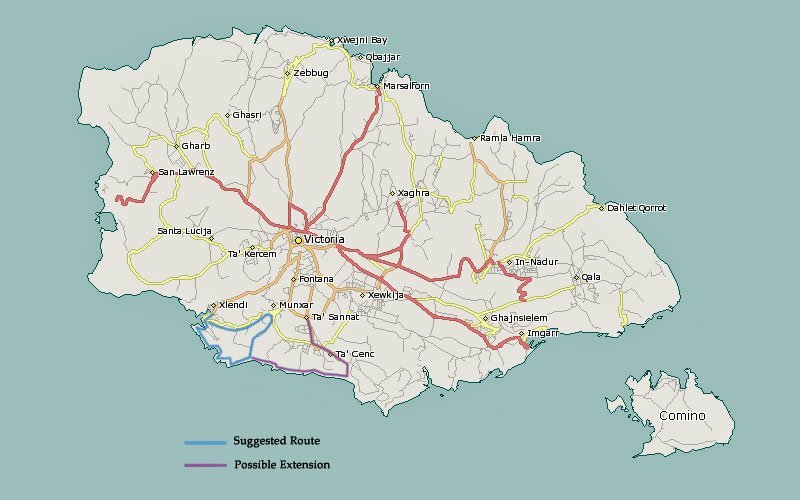 From here the path becomes a well laid out paved one and the views now stretch as far as Comino and the north coast of Malta. At the end of the paved path a narrow road leads back to the tiny village of Munxar from where one can easily get back to Xlendi via the panoramic road set between open fields – and the whole track would have taken you about two hours. There’s more edge of the cliff walking if you’re so inclined as the cliffside track continues on a more or less level path to the outskirts of the village of Sannat, and past that on to the large Ta Cenc plateau – itself an equally wild and beautiful site. Allow three to four hours for this second option. The walk is a relatively easy one and can be appreciated at all times of the year but spring brings out the best of this coastal walk as the vegetation is at its vibrant best. In the hot dry summer an early morning or late afternoon start is best. Some drinking water and sun screen are essentials….plus a camera!